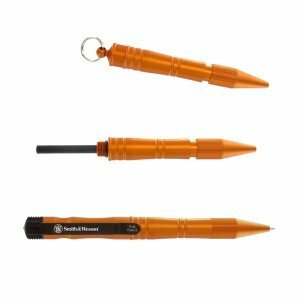 Smith & Wesson’s latest addition to their tactical pen lineup: the Tactical Fire Pen. Combining survival gear items into one is all the rage these days. Truthfully, the practice falls in and out of fashion ever other decade or so. And pens have long been the subject of “hidden” features. Fusing together a pen, kubaton, and ferro rod, this pen offers a trio rather than the typical duo, pen/kubaton. All packaged up in a 6.1″ T6061 aircraft aluminum body. And reportedly accepts widely available parker refills. I like the “tactical” orange color. The assault pen ban has this pen limited to one color only; no multiple color magazines. Hadn’t heard there was a ban! Do you have a link to an article, Larry? Too hilarious. I bet they’d pick it up by the end of the week. We all thought it was hilarious when Tim Minchin wrote a song about canvas bags but now look where we are, paying a tax on carrier bags. If this ban becomes a reality I’m blaming you.